Seoul, South Korea -- Hwajeong Museum, which boasts a rare world-class collection of Tibetan Buddhist art, will reopen tomorrow at its new home in Pyongchang-dong in northern Seoul. Established by the Hahn Cultural Foundation in Itaewon in 1999, the museum has served as the repository and showcase for the artworks that Hahn Kwang-ho, pharmaceutical entrepreneur and chairman of the foundation, has collected from Korea and around the world in the past 40 years. After more than two years moving, the museum will be reborn as an Asian art museum equipped with the most up-to-date facilities, housing large exhibition halls, seminar rooms and strong research staff to keep its reputation as a venue of numerous unique exhibitions up to date. On the first floor of the new museum, the representative collection of Tibetan ``thangkas’’ will be displayed. Thangkas are Buddhist paintings used for meditation and ritual. The second floor is exhibition space for Korean ancient artworks as well as artworks from China, Japan, Vietnam and other Asian countries. There are more than 3,000 Korean artworks including paintings, calligraphies, Buddhist paintings, ceramics, antique medicine jars and others. The Chinese collection comprises around 4,000 items including works of painting, calligraphy, and crafts such as ceramics, metal ware, lacquer ware, garments, ornaments, and embroidery. 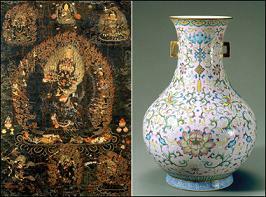 The museum’s collection of Tibetan Buddhist art is unequalled in Korea, both quantitatively and qualitatively. There’s more than 2,500 artworks such as thangkas, Buddhist paintings, Buddhist sculptures, Buddhist altar objects, and sutras. To celebrate the reopening of the museum, it will hold a special exhibition titled ``Gazing Upon Asian Art,’’ a perspective on distinctive Tibetan thangkas that represent Tibetan history and religious art. The exhibition brings Japanese and Korean collections all together at the Hwajeong Museum for the first time. The exhibition will continue until Aug. 30 No entrance fee. The exhibits will be updated every six months. Beginning next month, the museum will operate a shuttle bus that will stop at Insa-dong, Sagan-dong and Pyongchang-dong. For more information, call (02) 2287-2994.